Gelett Burgess’ "The Ballad of the Hyde Street Grip"
O'Farrell/Jones/Hyde car on O'Farrell Street before 1900. The tall building with the ornate roof was the Spreckels (also called Call) Building. It still stands at Third and Market with a less ornate roof. It is now called the Central Tower (Source: [group 3:28], Roy D. Graves Pictorial Collection, ca. 1850-ca. 1968, BANC PIC 1905.17500--ALB, The Bancroft Library, University of California, Berkeley.). 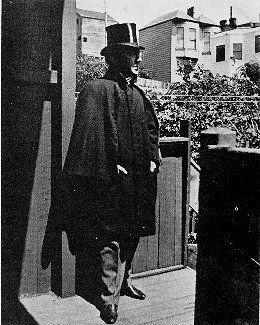 Gelett Burgess (1866-1951) published "The Ballad of the Hyde Street Grip" in 1901 in his book A Gage of Youth. Burgess' most famous poem was "The Purple Cow" (Source: The Barbary MUSH Photo Archive). May 15, 2004 marks the 50th Anniversary of cable car No. 51 (still in service on the California Street line) pulling into the former California Street Cable Railroad's (Cal Cable) California and Hyde Street car and powerhouse, ending approximately sixty-three years of service of the O'Farrell, Jones and Hyde cable car. When the Municipal Railway took over the operations of Cal Cable on January 13, 1952 there had been high hopes for the continued operation of the company's three-line cable car system. The private company had suspended its operations July 31, 1951 because Lloyds of London canceled the company's insurance after a waitress, injured in an accident, won a $140,000 judgment. 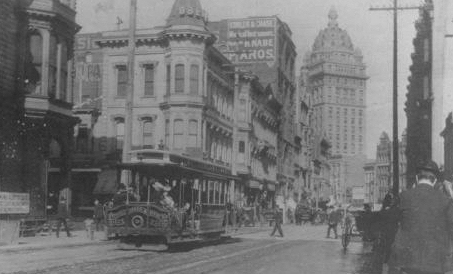 On February 9, 1891, Cal Cable had opened the crosstown O'Farrell, Jones and Hyde Streets line (2.5 miles) and the Jones Street shuttle from O'Farrell to Market Street. These were San Francisco's last entirely new cable car lines. The construction of these two lines required the required moving the company's powerhouse from Larkin and California to the corner of California and Hyde. The bottom grip O'Farrell, Jones and Hyde and Jones Street Shuttle "California" style cars - a "double-ended" car with an enclosed middle section and open sections at both ends - had a single grip located on the car's south-end. On the north-end an alternative grip lever was linked to the actual grip by a connecting rod. During 1911, Cal Cable shifted two California Street cable cars to the O'Farrell, Jones and Hyde line to meet ever-increasing ridership. The line had become a solid money maker for the company. What followed, until the post World War II period, was years of a very lucrative enterprise enjoying exceptionally good management, good labor relations and strong daily traffic. However, after Municipal Railway 1952 take over, Muni soon discovered that the high operating costs of the former Cal Cable lines resulted in their running at a loss higher than their Powell Street counterparts. The O'Farrell, Jones and Hyde line interfered with desired one-way street patterns, notably on O'Farrell. These factors coupled with an anti-cable car feeling, a narrow accountant's mentality on the part of Muni management and the majority of the Board of Supervisors led to the abandonment of the O'Farrell, Jones and Hyde line during the mayoralty of Elmer Robinson, who had risen to mayor on a pro-cable car platform. On April 7, 1957 Muni opened the new Powell-Hyde line. The line was created by cutting back to Hyde Street the Washington-Jackson cable line and combining it with the former outer Hyde Street leg of the O'Farrell, Jones and Hyde line. Since single-ended Powell cars replaced the former double-ended cars a new turntable and trackage was constructed at Hyde and Beach Streets (now the Friedel Klussmann Turnaround). It is still possible to ride down the Hyde Street Hill with its 20.67% grade enjoying the spectacular views of San Francisco Bay and Alcatraz. Now it time, as a tribute to O'Farrell, Jones and Hyde line to listen to a reading of Gelett Burgess' "Ballad of the Hyde Street Grip". The poem describes the line before the 1906 Earthquake and Fire. This reading was recorded especially for this site to commemorate the 50th anniversary of the abandonment of the once important O'Farrell, Jones and Hyde line. The reader is Craig Hulsebos of KEAR radio. The recording was made by Thad McKinney, also of KEAR radio. As background you will hear cable car sounds recorded by Thad on a Powell- Hyde cable car being gripped by gripman Val Lupiz. Listen to "The Ballad of the Hyde Street Grip" (1.8 Megabyte file) using Windows Media Player. If you don't have Windows Media Player, you may download it for free from Microsoft. Please be prepared to wait a short time for the reading to start. Below is the text of "The Ballad of the Hyde Street Grip." When the cable strands are loosened she is nasty hard to hold! It takes a bit of doing on the Hyde Street Grip! Watch her well at Geary and at Sutter when you coast! Sacramento, Washington, Jackson--all the way! You'd better keep 'em busy or you'll soon be going wrong! You are apt to earn your wages on the Hyde Street Grip! Down upon the other side, hanging to the rope! But the view of San Francisco, as you take the lurching dip! There is plenty of excitement on the Hyde Street Grip! You'd see Westminster Abbey, and you'd say that it was grand! Atop a Paris omnibus, no doubt you'd thank the Lord! How the pulleys slap and rattle! How the cables hum and skip! Oh, they sing a gallant chorus to the Hyde Street Grip! As the hush of midnight falls upon the Hyde Street Grip! Go to California Street Cable Railroad. Copyright 1996-2004 by Walter Rice, Gellett Burgess and Joe Thompson. All rights reserved.